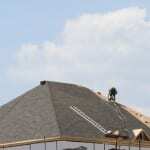 Roof repair is essential to protect your home from damage. A lot of people tend to ignore the warning signs that show they need roof repair because they do not think it is a big deal. If your front door was hanging on the hinges, you would not leave it like that. You would get it fixed, so that random strangers would not have access to your home. Since your roof provides protection for your entire home it is essential that you take care of your roof. At Slippery Slope Roofing we know how important it is for you to protect your home, not only as an investment, but as a safe place for your family to live. Roof repair is required if you notice any signs of damage on your roof. If you notice missing shingles on your roof or granules of shingles in your rain gutters, you should have your shingles repaired. This is showing you that your shingles are old and are not functioning like they should. You can also look for signs that your roof is sagging or drooping in places. This needs to be fixed before you experience serious problems like your roof collapsing. You also can tell there is a problem if you notice any signs of water leaking and water damage. If you are looking for a great company for roof repair on your home in Midhurst, Ontario, contact us at Slippery Slope Roofing today. We can come and inspect your roof and let you know if there is a problem. We have over 50 years’ worth of experience doing roof repair, and we can take care of your roof in no time. We are accredited with the Better Business Bureau, and we never cut corners to get the job done faster. We provide our customers with quality roof repair, so that your home can be protected.